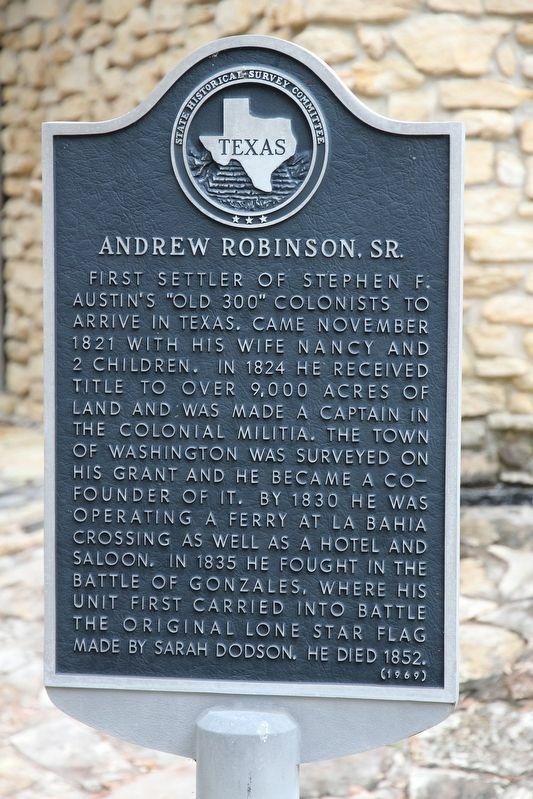 First settler of Stephen F. Austin's "Old 300" colonists to arrive in Texas. Came November 1821 with his wife Nancy and 2 children. In 1824 he received title to over 9,000 acres of land and was made a Captain in the colonial militia. The town of Washington was surveyed on his grant and he became a co-founder of it. By 1830 he was operating a ferry at La Bahia Crossing as well as a hotel and saloon. In 1835 he fought in the Battle of Gonzales, where his unit first carried into battle the original Lone Star flag made by Sarah Dodson. He died 1852. Location. 30° 19.445′ N, 96° 9.235′ W. Marker is in Washington, Texas, in Washington County. Marker can be reached from Park Road 12. Touch for map. Marker is located near the Star of the Republic Museum. Marker is at or near this postal address: 23200 Park Road 12, Washington TX 77880, United States of America. Touch for directions. Other nearby markers. At least 8 other markers are within 12 miles of this marker, measured as the crow flies. George Campbell Childress (about 600 feet away, measured in a direct line); Washington County (about 700 feet away); Washington-on-the-Brazos (approx. 0.2 miles away); Barrington Plantation (approx. 4.6 miles away); Primus Kelly (approx. 8.7 miles away); Millican, C.S.A. (approx. 10.4 miles away); Robert Emmett Bledsoe Baylor (approx. 11.4 miles away); Home Built in 1845 by General Jerome B. Robertson (approx. 11½ miles away). Touch for a list and map of all markers in Washington. More. Search the internet for Andrew Robinson, Sr.. Credits. This page was last revised on March 20, 2019. This page originally submitted on March 11, 2019, by Brian Anderson of Kingwood, Texas. This page has been viewed 48 times since then. Photo 1. submitted on March 19, 2019, by Brian Anderson of Kingwood, Texas.